Hourly Vs Salary Employees – What is the Difference? Wage employment is one of the ways to earn money. Any person working for an employer and the remuneration what he gets for his service is called wages, it may be given by the employer to an employee on a daily basis or weekly basis. On the other hand, salary will be provided once in a month, a fixed sum of money as mutually agreed by both employer and employee will be taken as salary by the employee for his/her in a total month. In this wage employment, the worker will be performing his/her duties under the employer supervision, one needs to follow the rules and regulations under-laid by the employer. When an employee receives remuneration from his / her employer for the specific work delivered by him/her in monetary terms, it is called wage employment. And the payment of such a task will be made at hourly or for daily. But there will be a fixed rate of price for the work delivered on a daily basis. How do Salary Job Works? There is some situation in a person’s life where he/she think about the salary he/she receives every month. The working environment of a salary mainly deals with the sole working life of the employee. When a person joins a certain type of company and starts working for that company the person receives a certain amount of fixed salary for the work he/she deliver on a daily basis. It is one of the safest and secured form of professional life where the employee is assured that he/she will receive a fixed amount as his / her salary for the work he/she delivered to the company. Most commonly the working hours of any type of salaried job stays within an hour of 8 to 9 hours and in that 8 hours of work, the employee may receive a fixed salary, and rest of hours of working after that 8 hours will be considered as overtime. Sometimes employee feels frustrated to work for 8 hours of their day, but it is how a salaried job works for them. As per the knowledge about certain governmental rules and regulation, there is a certain type of fixed days of holidays or leaves which will be granted to the employee of any private or government organization. Their total number of personal leaves, medical leaves and leave without pay are all calculated. The incentives of the employee will receive on a daily basis by the work delivered by him/her. These incentives are one of the extra benefits received from the employer to the employee for their covered future and security. In these incentives, the company offers the employee all the extra benefits of medical, family security and house rental facility and much more. There is a certain kind of situation where the employee may decide intentionally or unintentionally resigning from the job. And the reasons for resignation can be personal and professional as well. But while resigning from the job, the employee will be cleared with all his / her due payment by the company without any argument by the company. Working hours differ in both the cases of wage-based job and salary based job. 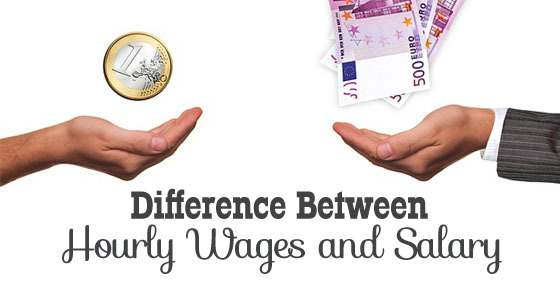 In both types of wage and salary based job there is one difference and that is their working hours. Working hours of a salaried job is considered as 8 hours and that 8 hours the employee need to provide his / her 100% for the job, but when it comes to wage-based job, the employee will be paid a fixed amount each day for the completed work given by him/her on a daily basis. In this wage the payment is made daily or hourly basis, but in salary based the payment is made on a monthly basis. As mentioned above the wage will be provided for the work delivered by them on an hourly or daily basis. And in a salary based the payment will be made on a monthly basis. It is as similar as a salaried job when it comes to its payment amount, but the difference is that the employees receive it at a different rate of price for their work. The payment of overtime will be differentiated in a different matter of dimensions. Most importantly the employee who is working on a salary based job will receive a fixed amount for his / her over time, but the overtime will be considered after the working hours of the company. But when it comes to a wage-based job, overtime will not be considered as after the working hours actually, it is considered on the basis of completion of the working hours. When it comes with the incentive benefits of the employee whether he/she is a salary or wage-based employee, there are certain types of elements which needs to be considered while making the deductions in the total salary or wage received by the employee. These deductions will be considered on the basis of their working environment of the company. There are different dimensions of tax when it comes to salary and wage-based system of working. The tax structure of salary based and hourly based structure are totally different from each other. Most commonly the benefits received from their other than salary comes with certain deductions for the tax structure for their own good. The possibility of tax applicable on an hourly based job is considered very less as it is not a fixed type of job. But when it comes to salary based job the tax is applicable on such type of job. As the working nature of a salary based job is fixed when compared to the hour based job, then the tax structure of such salary job differs as per their working environment. The tax structure in salary and hourly based wages will be totally different. As commonly considered the fact that the tax structure will not affect the hourly based job as much as salary based jobs. Receiving a fixed amount of salary comes with an exact tax structure which can prevent tax returns as well. Therefore, the tax structure is available in a salary based job when it is compared to the hour based job. As explained earlier above, the tax deduction will not be applicable to the employee who work on hourly based wage structure. And such tax deduction will definitely affect the employee who receives a fixed amount of salary. The probability of deduction in salary based job is higher than the hourly based job, as the working environment and benefits offered by the salary based is higher than each other. The possibility of additional tax in both cases will be different on the basis of the circumstances of the situation. When it comes to the salary based job the additional tax will not be applicable as much as the wage or hourly based job, these additional tax is not that necessary to consider in both the cases. In both the case of salary based and hourly based, the possibility of adding additional taxes will be high in salary based job as it receives better benefits from an hourly based job. There are different types of pros and cons of these salaries and hourly based job structure. And some of them are different and common in their nature but it is necessary to understand all the pros and cons of these salaries and hourly based wage to clear thing at their beginning itself. It is necessary to understand that there are different factors that needs to consider while clarifying the difference between the salary and hourly wages. Firstly, when it comes to salary based wage the time constraint is fixed as compared to the hourly based wage, which makes things easy for an hourly based job. It is beneficial for those employees who work on a salary based wage. When the employee works on a project at a salary based job the possibility of receiving his / her monthly salary is fixed, but when it comes to the hourly based job the possibility of receiving their wages will depend on their working environment of the project which is not fixed. As it is explained earlier, the possibility of receiving chances of overtime in salary based job is comparatively less than the hourly based job and that’s because the salary based job receives a fixed amount at the completion of the particular month for their work delivered, but when it comes to the hourly based job it depends on the work completion which is not fixed. Therefore, if overtime will be provided to the hourly based job it will not make any such kind of change in their working environment or payment. It is important to know that the a salary based job receive a fixed amount of salary at the end of every month whether the work allotted is complete or not, but in an hour based job, the employee need to complete the day’s work to receive his / her daily wage. There is some sort of wrong thinking about hour based job that it is flexible to work, but it is not true because the flexibility of work is not applicable to the hour based job. When it comes to the benefits and other incentive related matters the salaried employee is considered better because of their fixed monthly salary package. The salary package of such employee includes all the benefits such as bonus, medical and travel allowances for themselves. Therefore, it is one of the benefits that comes with a salary based job when compared to the hourly based job. It is considered beneficial than an hourly wage based job. One may choose any path to earn his bread either hourly or salary based wages. At the end of the day our motto is to earn, as per own interest, limitation people choose the way of working. We can find both economic activities have equal benefits. All one need to care is about assurance of job in the hands, in hourly they get a chance to work with different projects and people while salary based have a fixed amount and assurance that they get a job every day. It all depends on how we manage the work. The retirement is flexible in hourly while compared to salary based.